The Tory leader voted against making changes to O Canada. Conservative Leader Andrew Scheer speaks to reporters during a media availability on Parliament Hill in Ottawa on Feb. 6, 2018. 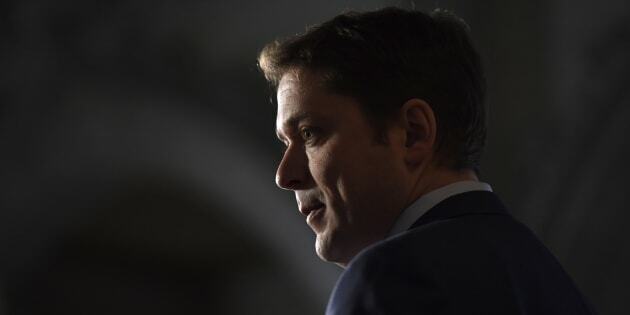 Conservative Leader Andrew Scheer has suggested he will only sing a gender-neutral version of O Canada after legislation changing the lyrics becomes the law of the land, something that is expected within days. Scheer was asked by reporters Tuesday if he will sing the new version of the anthem, which replaces the line "in all thy sons command" with "in all of us command." The Tory leader noted that he voted against the changes, which were proposed in a private member's bill introduced by late Liberal MP Mauril Belanger. The veteran MP died of Amyotrophic lateral sclerosis (ALS) just two months after his bill cleared the House of Commons in June 2016. With Belanger's bill passing in the Senate last week, all it needs to become law is royal assent from the Governor General. Scheer told reporters if the government wanted to change the anthem, they should have done so "through a government bill with proper consultation." Many Canadians are probably unaware the anthem has changed, he said. "So, what will you sing tomorrow?" a reporter asked, referring to how MPs belt out 'O Canada' together in the House of Commons each Wednesday. "It hasn't got royal assent yet, I believe, so I'll still be singing... until it actually becomes law," Scheer said, smiling. "It hasn't got royal assent yet. So, it's not..."
And when the Governor General does officially sign off on the changes? "I respect the law and I respect that when laws are changed that it has meaning but I'm disappointed that it has been changed," Scheer said. The Tory leader added that the anthem doesn't belong to any MP or party. "It's a national institution, it's our national anthem that we've been singing for decades," he said. "To make that kind of a change, I believe Canadians should have had a greater say on it. Not just a private member's bill that received a couple hours of debate and a couple hours at committee." Asked one more time if that means he'll sing the new version, Scheer offered: "I will respect the law when it's changed." Belanger's bill easily cleared the House by a final vote of 225-74, with the support of Liberals and New Democrats. Though Tory MPs overwhelmingly voted against the anthem changes, nine others supported the bill: Sylvie Boucher, Michael Chong, Alupa Clarke, Bernard Généreux, Peter Kent, Deepak Obhrai, Lisa Raitt, Michelle Rempel and Gerry Ritz. The previous Tory government pledged a gender-neutral anthem in a 2010 throne speech but backed down in the face of public backlash.